This dry shampoo goes on clear and has a fruity/floral scent. It helped absorb excess oil, but I didn’t notice any difference in volume. In general, it’s a solid dry shampoo, but not something I loved enough to buy in full-size. After seeing lots of repeat products in this box, I’m happy that this nail polish is a new-to-me brand and full size! Plus, I can always use more topcoats. It dried quickly and gave my nail polish a nice gloss. I wouldn’t say it’s a gel look, though. Verdict: This box has a value of about $9.77. That’s OK for a $5 Beauty Box. A lot of the items in this box had been in past Walmart Beauty Boxes, so it wasn’t the most exciting thing to unbox, but I’ll use almost all the products, and I was happy to see the inclusion of SOO AE and a new nail polish brand. What do you think of the Winter Walmart Beauty Box? Did you get the Classic or Trendsetter box? I was charged for my Fall box on 2/10/18. I received it on May 19, 2018. Yeah. I had simply given up. This is ridiculous. At the beginning when I first started getting the boxes they were good, they seem to be sent out mid way through season or I do not get mine until the season is just about over, the products use to be good now not so much, so I will be cancelling my subscription. I am happy with these for $5. Now if they’d just ship the Classic box that I was billed for 6 weeks ago, I’d be content with them. I’m about to email them for a refund on that other one. I was charged 2 months ago. Still haven’t received either box. Same here. I emailed them 2 weeks ago and they said there was a delay from Fall boxes that carried over and delayed Winter boxes….I’m cancelling my subscriptions. I finally got charged for my Trendsetter box today. The Winter box, I mean. Now that it’s been Spring for about a week. I still have not been charged. I even emailed and asked what the deal was and was told “we are finishing up our last waves of billing and shipping for the winter box now. Look forward to an email about billing soon.” That was on Monday…still nothing. I guess I’m literally in the very last wave. Again. I got my Fall box after they announced Winter boxes being available and starting to ship. I have two accounts and both have yet to be billed/shipped. I got the same email response you got *sigh* I’m fine with getting it later so long as the products aren’t of less value or fewer item overall. Though with it now being April and my last charge was Nov with my last box Dec/Jan it’s getting to be a little trying on patience. I am so disappointed that they no longer allow you to add a box to your subscriptions. I loved surprising people with the box, and have sent them to my daughter and daughter in law. When I stopped my daughter’s box because she was moving from NYC to San Francisco, they wouldn’t let me add her again. I am not sure how everyone is getting the Classic and Trendsetters sent out to them because I cannot add another box to my account. I know they have the “Gift” subscription, but what I really wanted to do was surprise the people I gifted. The Gift subscription requires them to receive an e-mail and then log in and answer questions. Contacted customer service to inquire, and they were pleasant but not helpful. I get both the Classic and Trendsetter by having two different accounts now with two different email addresses. Finally today got my Trendsetter box. Account says pending shipment. I got Aveeno lotion sample, donkey mask, full size degree deodorant and auquaphor lotion. All repeats, but stuff I will use. I was hoping for a couple more items and/or Gold Bond lotion lol. Used my Target box coupon on that lotion today. Great stuff. Was that all that was in it? Ugh. The donkey mask is disgusting. And I have enough of the rest to last a lifetime. I was hoping at least to get a nail polish. I’d rather have the $5.00 and wait for the Spring box. I LOVE everything I got!!! I never care about a toiletry box being delayed and for $5 bucks this is so worth it to me. I got 2 full sized deodorants, dry skin care items for my purse, bath soak for those days when you need it, new hair products generously sized for multi uses, and new skin care item also generous and with two of them I can really see if I like them. What?!? Customer service issued a re-order?!? I have been been in touch with their “customer NO-service” (not actually Walmart, the boxes are fulfilled by BrandShare) every week for the past 4 – 5 weeks – because I was charged for both boxes on FEBRUARY 9th – OVER 7 weeks ago! And all they ever say is that there have been some “delays” and the distribution center is “working on it”! MB – I am in the same boat. Charged on Feb 9 for 2 boxes. I’ve contacted them twice and I was told both times that the boxes are at UPS and are “pending shipment”. For 2 months!?!? Ugh. I still haven’t received my trendsetters box or classic box for winter. I haven’t even received a email. After seeing Liz’s review I logged into my account and both subscriptions are still active with correct payment information, but no update since November when I received my Fall box! I really don’t understand what’s going on, so I sent a email to their customer service team and hopefully will know something soon!? OMG today is March 12, it’s 73 degrees in Northern California, and I just got an email that I should log on to my account to confirm my shipping address for my WINTER box. I wonder what they even have left at this point. I got the email today too! It says to reply by January 25, 2018 if there are any changes to your shipping information. Whoever is running this thing clearly does not care – at all! I’m still waiting on my box.. I got my first box today and I got two? My account says ‘ordered one, shipped one’. Each one had a different deodorant and a gold Bond radiance renewal lotion. Then one box had a Jergens wet skin moisturizer pink nail polish and a charcoal sheet mask. The other had an aquaphor ointment body spray a purifying brightening peeling gel and a mineral bath soak. There was also shampoo & conditioner sample that I think came in the box but maybe The other. I needed deodorant so I’m happy not to have to buy. Most of this I will use. The rest will be donated. Me too. I just emailed today. I’ve never had a problem in the past. Hope you hear/get your boxes soon. I caved and ordered the InStyle box. I had cancelled walmart subs, so I thought haha. Still signed up for Trendsetter. Still not Billed for Winter box on March 6th. I emailed Walmart and received the standard reply “we are still in Billing phase, you will receive confirmation soon…” I was not expecting a box, so i will stick to that plan. Maybe i will get a surprise. My accounts were debited on 01/27/2018 and on 02/12/2018 and I still have not received my boxes. It is almost time for them to start shipping the spring boxes. I have sent them 3 emails regarding this and no response. My account is showing 3 boxes ordered and 3 boxes shipped but not shipping information or confirmation email. This may be my last order from Walmart and I may file a complaint with the BBB. You should not charge someone and then not deliver as promised. I received the Winter Trendsetter yesterday. And got the tracking info this morning. Real efficient. But at least I got the box! I got exactly the same box today. This is almost the same as my fall box. My winter box came a few weeks ago and had a full sized maybelline lipstick and lipliner, a soo.ae peel off mask, aquaphor spray-on lotion, aveeno lotion, and dove body wash. I was really impressed with the value. I think it’s just a luck of the draw sort of deal because it seems like they ship in batches due to demand and create the variety based on stock. 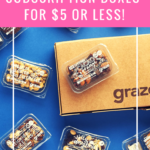 It is a free box designed to generate business and the $5 is for shipping. I like the quarterly surprise because I pass up a lot of drugstore brands otherwise. This is what I received today too! Really glad I got what I got and not what is in the trendsetter spoiler/review. My last boxes were in November. I just checked my account and they haven’t even charged me for these boxes. Did I get my set early or is this a different set? I got my trendsetter box a week or two ago and mine had a full size deodorant, a 1 ounce Aveeno body lotion, a nice razor with extra blades, and three or four foil packets if various lotions or serums most had two items hooked together. Mine was the same and VERY disappointing! I got the toothpicks in a previous box. I have many dry shampoos from other sub. boxes. Donkey milk? No thanks! I got BLUE nail polish I’ll never wear. I’ll use the lotion but I already have a bunch. So basically it was awful and very empty. I know it’s only $5- but these boxes used to be good. What happened? I know, right? My last box did not have everything that they said was supposed to be in it, then they wanted me to do a “review” on EACH item? How can I do review on items I did not receive? And you got toothpicks? Wha?!?! Try the donkey milk…. I thought it sounded weird too, but tried it & it’s one of my favorite masks – beats out a lot of higher end masks I’ve tried! Very moisturizing. Very confused. My email said I got the Trendsetter box, but mine had a full sized deodorant AND a full sized razor with extra blades, along with a couple other little things. This looks like what I got in the fall from this box. This is what I got in my fall box back in December except instead of nail polish I got a toothpaste. I haven’t got shipping yet for my winter box but it should be coming. Most of the winter boxes I’ve seen had the same as you said. I hope I don’t get repeats if so ill be canceling. Have not received my winter box yet. Hopefully I will get one soon. I get the Classic box and this is what I received except a bright pink polish. I received mine last week. I don’t know what is going on with these boxes lately but I’m happy with the winter classic box! I also subscribe to the Classic and got all items in this box. I received a light blue shade of nail polish called “Old Maid.” I thought it was an ironic twist, but I guess I wasn’t the only one that got the box variation. 😊 I like the variation I received. I was pretty bummed when I saw the Classic reveal. I cancelled even though I lucked out this time. I am on product overload and I would rather not get any boxes that I am excited to receive in the mail. I got the gold bond and soo ae in the fall box. The lotion has been the only thing to work on my dry hands this winter. I used the sleeping mask on my face but I also used the excess on my hands. It worked really well on them too. I got something completely different. I got the John Frieda frizz ease conditioner, the donkey milk mask, ban deodorant, okay luminous foil packet, biore acne scrub free your pores. Wasn’t impressed and it’s crazy that they gave everyone who’s a trendsetter status like myself all way different yet same kinda things. Oh also got gold bond lotion. Not impressed but not upset either bc I can definitely use everything that came in this. I got the same box as you too! I received all of those things as well as some impress press on nails and a soapbox body wash. This box was loaded. I’m glad I received these items since this is why I decided to sign up again after seeing someone’s YouTube video. Wow, I received three of these items in the Fall 2017 box (can’t remember if it was Classic or Trendsetter). I hope I don’t get the same box again. Anyone know how to change from classic to trendsetter? Go into account and change the age. These boxes seem to vary WILDLY. This was my first time subbing, and my box is trendsetter, but it’s nothing like this box. I think the dry shampoo is the only thing I got. I got a biore cleanser, Aquafor, and I can’t remember what else. Haven’t been charged yet for my Classic or Trendsetter boxes…just got my FALL Trendsetter box a couple of weeks ago (literally) after sending them an email inquiring if I was ever going to get one. So I’m not really expecting to ever get winter ones. LOL. Guess we’ll see….based on the “spoilers” I really don’t care enough to send another email and bother asking again. I still haven’t been charged what about you? I got mine weeks ago. I believe there are new ones being sent right now. I subscribe to both their boxes. I got this one (except I got a nice, natural pink polish) a couple of weeks ago and they have just charged me for two more. Wow. Got all that last time, except the nail polish (not my favorite brand though). I received the email a couple days ago, and got billed today… will probably get the box in 3-6 weeks, as slow as they are. No. This is Winter 2018. On time. Fall box was very late in shipping. I might have got it in Nov. I can’t recall now. I got the mask, teeth picks and lotion in one of the Fall boxes. I hope they have more variations! Full size Maybelline lipstick and Full size clear lip liner! I believe this was a good haul for my winter box. This is exactly what I got, too, and I was really happy with it! That’s what I got too! I was really happy, especially for the clear lip liner! That’s what I got, too. The products in the review were what I got in the fall box. I thought the winter box I got was great!